You asked for it. You got it. You wanted an all-wheel-drive Rothmans Rally Car and here it is. There’s some serious lust for Porsches–especially those with a more esoteric flare. 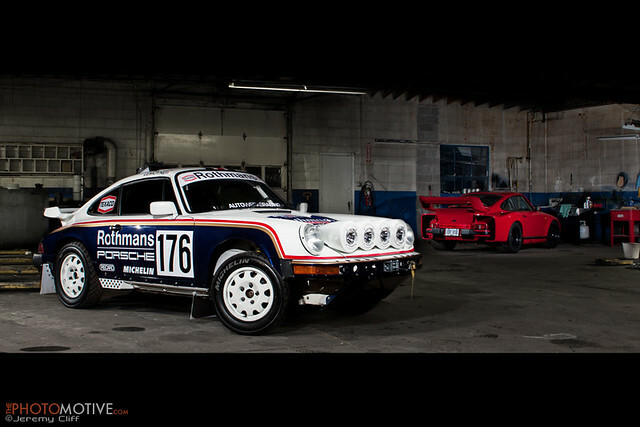 Its a clone/tribute of the Rothmans Porsche 953 rally cars that ran around Africa in the early eighties. Very nicely put together and going for a fraction of the cost of a real deal version. If you remember July of 2010 when the 2-wheel-drive 1980 Rothmans Rally Car sold to GoPro for upwards of $70,000 on eBay. Although that car was stunning in everyway the owner knew he needed something more. He searched the country high and low for the perfect donor and finally found an accident free, perfectly maintained, weekend driver, pilot owned, all original with every factory option 1989 1/2 Porsche 964 C4. She is an absolutely stunning freshly completed Porsche 911 Paris, Alger, Dakar Winning 953 Off Road Rally Tribute Car that has been painstakingly built over last year. She was built as a tribute to the winning Porsche 953 raced from Paris to Dakar in 1984 Piloted by Rene Metge and Dominique Lemoyne. 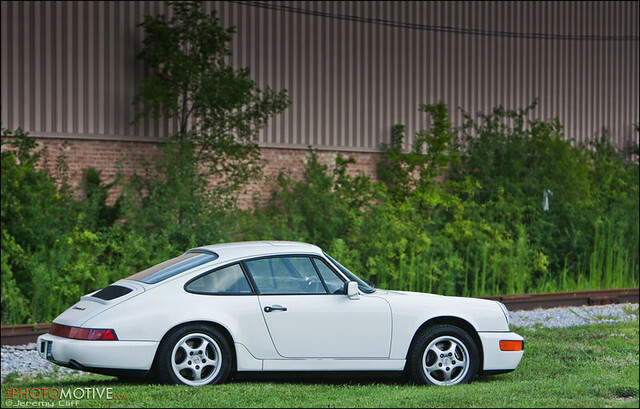 Paris originally started life as a 1989 1/2 Porsche 964 Carrera 4 in PERFECT condition and is perfectly street legal and plated and titled in Illinois. Over the last couple months Jeremy Cliff has been shooting and prepping photos and video of “Paris”, this Rothmans Porsche 911 Tribute Car, the time has finally come to put the car up for sale and release the photos. Jeremy wanted to do something very different and have a unique location wise…. I’m sure most of you will recognize it, but for those that do not the “house” location is actually the house that was used in the famous 1986 movie Ferris Bueller’s Day Off. What better spot to shoot a historic vehicle then in a historic location? Check out the video below of the car in action! Car was built with the intention of being a daily driver or a weekend warrior which means it has some very key options. Tires- Michelin ZEL 70’s 16/65-15 mounted on authentic Porsche rims. Wing- GT Racing 911/930 Turbo Tail. Steering- Power steering with factory Porsche steering rack, modified steering tie rods. Front body tub where tires would rub on tight turns was modified to accommodate lock to lock steering and increased suspension travel. Roll Bar- Custom fabricated by one of the leading pro-trophy-truck chassis builders in the United States. No expense spared. 1 and 3/4 inch .095 4130 Chro-moly. Roll bar integrates front and rear strut tower braces and winch mounting plate. Custom tube clamps to allow every day easy access. Winch- Superwinch with remote capabilities and cockpit switch. External remote plug integrated into front bumper into fairlead. Lightpod- Removable custom lightpod attached to hood. Four (4) Hella 55 watt motorcycle DOT fog lights internally flush mounted with external milled plastic bezels for adjustment (all stainless steel hardware), aircraft grade stainless steel turn buckles bank. Oil Cooling- Stainless steel oil lines and AN oil fittings for plumbing oil lines to custom mounted factory Porsche oil cooler with factory oil fan. Doors- Fabricated aluminum door panels. RS America door exit straps. Porsche window switch and Porsche leather armrest all incorporated into door panel. Hi there, simply was alert to your blog through Google, and located that it is truly informative. I?m gonna be careful for brussels. I will appreciate in case you proceed this in future. A lot of people will likely be benefited out of your writing. Cheers! Hello there, just became aware of your blog through Google, and found that it’s truly informative. I am gonna watch out for brussels. I will be grateful if you continue this in future. Numerous people will be benefited from your writing. Cheers! Nice post. I was checking continuously this blog and I’m impressed! Extremely useful information particularly the last part 🙂 I care for such info much. I was looking for this particular info for a very long time. Thank you and good luck. hello there and thank you for your information � I�ve certainly picked up anything new from right here. I did however expertise some technical points using this web site, as I experienced to reload the site a lot of times previous to I could get it to load correctly. I had been wondering if your hosting is OK? Not that I’m complaining, but sluggish loading instances times will often affect your placement in google and could damage your high quality score if advertising and marketing with Adwords. Well I�m adding this RSS to my email and can look out for much more of your respective exciting content. Ensure that you update this again very soon.. Fantastic goods from you, man. I’ve understand your stuff previous to and you’re just extremely great. I actually like what you’ve acquired here, really like what you’re saying and the way in which you say it. You make it enjoyable and you still take care of to keep it sensible. I can not wait to read much more from you. This is really a great site. Pretty nice post. I just stumbled upon your blog and wished to say that I have really enjoyed surfing around your blog posts. In any case I will be subscribing to your feed and I hope you write again soon! I like the helpful information you provide in your articles. I will bookmark your blog and check again here frequently. I am quite certain I�ll learn a lot of new stuff right here! Best of luck for the next! We are a group of volunteers and starting a new scheme in our community. Your website offered us with valuable information to work on. You have done a formidable job and our whole community will be grateful to you. This is really interesting, You are a very skilled blogger. I have joined your feed and look forward to seeking more of your wonderful post. Also, I have shared your web site in my social networks! Hey There. I found your blog using msn. This is an extremely well written article. I�ll make sure to bookmark it and come back to read more of your useful info. Thanks for the post. I will certainly comeback. I loved as much as you’ll receive carried out right here. The sketch is tasteful, your authored subject matter stylish. nonetheless, you command get bought an edginess over that you wish be delivering the following. unwell unquestionably come further formerly again since exactly the same nearly a lot often inside case you shield this increase. Hello, i think that i saw you visited my site thus i came to �return the favor�.I’m attempting to find things to enhance my website!I suppose its ok to use a few of your ideas!! Just want to say your article is as amazing. The clearness in your post is simply great and i can assume you’re an expert on this subject. Fine with your permission let me to grab your RSS feed to keep updated with forthcoming post. Thanks a million and please continue the enjoyable work. Its like you read my mind! You appear to know so much about this, like you wrote the book in it or something. I think that you could do with some pics to drive the message home a little bit, but instead of that, this is excellent blog. A great read. I will certainly be back. I’m really impressed with your writing skills as well as with the layout on your blog. Is this a paid theme or did you customize it yourself? Either way keep up the nice quality writing, it is rare to see a nice blog like this one nowadays.. Attractive section of content. I just stumbled upon your blog and in accession capital to assert that I acquire in fact enjoyed account your blog posts. Anyway I�ll be subscribing to your augment and even I achievement you access consistently rapidly. Wow, fantastic blog layout! How long have you been blogging for? you made blogging look easy. The overall look of your site is wonderful, let alone the content! This is one of the most interesting and comprehensive posts I’ve read on a Porsche build. Good work! Check out dedeporsche’s fantastic post on the build of this awesome 911 rally car! Wonderful goods from you, man. I have understand your stuff prior to and you’re simply extremely great. I actually like what you have received right here, certainly like what you are stating and the way in which in which you assert it. You make it entertaining and you still care for to keep it wise. I cant wait to learn much more from you. That is actually a great website. Heyy there, You’ve done a great job. I will certainly digg it and for my part syggest to my friends. I amm confident they will be benefited from this web site.